Well here we are, in Jolly Olde. I think I may have overstated my worry about overseas travel, as I have received many congratulatory messages on social media for making it here alive — for “surviving.” hahaha OK, probably my fault. But enough already — please. I’m good. I know that little Trevor (3-year-old seated directly in front of me) and little Georgia (also 3, seated several rows behind in the next cabin division) just wanted to get off that plane and go home. And six hours is a long time to make a squirmy toddler sit. But again….Noise. Canceling. Headphones. So along we went, soaring at 40,000 feet, and I monkeyed around with the video screen on the back of the seat in front of me. It didn’t take long to see that in some small way, the Thriller was here with me. On their “Classic Rock” music selection, they had the entire album End of the Innocence, which contains one of his favorite songs. I listened to it a few times over. But I think he stayed on the plane, because it was insanity from the moment it touched down in Manchester. It took them f-o-r-e-v-e-r to find a parking space, and of course, I’d planned to allow myself 30 minutes to get to the train station (a 10-minute walk) after our on-time flight. Good, ja? Nah, not so good. I missed the first train, but fortunately I’d bought an all-day ticket. So I waited in the damp cold for an hour for the next one. One train switch and an hour later, I was walking into Liverpool Central Station. A nice gentlemen told me how to get to my hotel. Fifteen minutes later, I walked into the beautiful lobby of the Nadler , ready to get off my feet after schlepping my 17-lb. backpack all over creation. They said sorry, but my room wasn’t ready yet. Oooookaaaay. I sat in the beautiful lobby and tried to not fall asleep. In 30 minutes, they came and got me. A nap was definitely in order, as I’d been awake for about 22 hours. 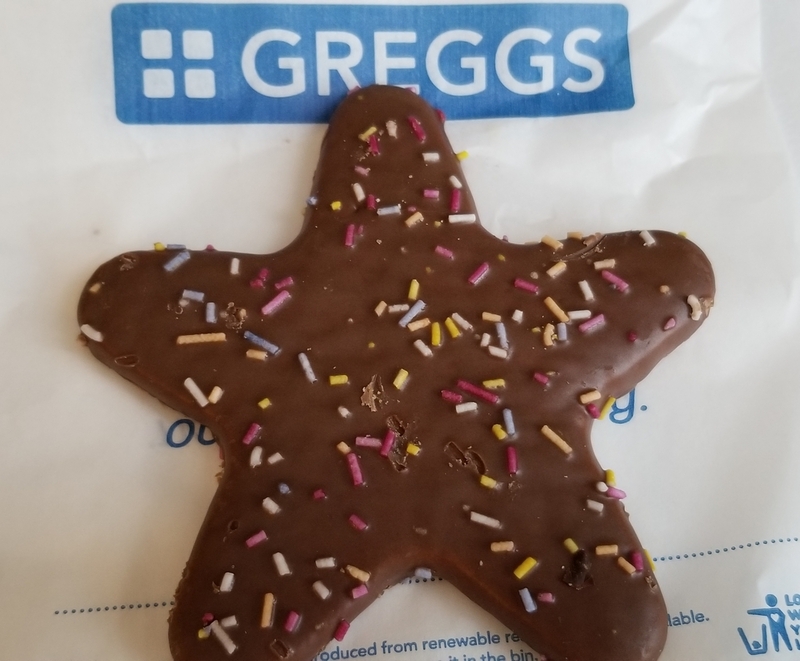 After some more curious walking, I decided to turn it around and head back to the hotel, but not before stopping at Greggs and picking out a Spiky Mikey for a bedtime snack. It’s late now — after 1 a.m. –and I’m still getting accustomed to the time change. I think I’ll sleep till 6, then escape somewhere for a quick breakfast before David, my private tour guide for the day, lah-dee-dah, comes to pick me up. More tomorrow, fiends — thanks for coming on the journey with me! How I wish I could be walking the narrow streets with you! ME TOO — NOW GIT WELL!!! Love you! Love your post – keep them coming. Wishing I had gone with my mom in 1988 after my dad had died – but my older brother went with her to see her cousins and birthplace. Connie, I know your family has a storied history over there. I wish you’d been able to go. Maybe you still can! Not much to say…just that I’m here and along for the ride! Have a grand time! ?? Keep those observations coming girl friend!! Can’t wait to hear all the scoop David will share with you tomorrow ~ Have fun!!!! Love you Kay — another post coming up! Have a great time with David!! I did! He could pass for my LRC’s (Labor Relations Consultant’s) twin brother! Crazy! Thanks pal. Been awhile — hope you’re well. Thanks Janet! And you’d figure it out like I did, I’m sure of it. When all else fails, ask for directions! Thanks for taking us with you via your blog and giving us vicarious enjoyment. You bet, friend — hope you guys are doing OK. Enjoy! I too will be along for the “ride”! Thanks Laura — I’m enjoying every minute!